"Formed by Rich Robinson, the guitarist and co-founding member of The Black Crowes, The Magpie Salute are an exciting band bringing together two other key members of Crowes fame, guitarist Marc Ford and bassist Sven Pipien, alongside members of Rich Robinson's own band; drummer Joe Magistro, keyboardist Matt Slocum and guitarist Nico Bereciartua. 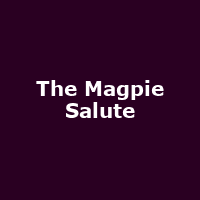 The Magpie Salute also boasts a fine cast of vocalists, including lead singer John Hogg (Hookah Brown, Moke), former Crowes singer Charity White and background singers, Adrien Reju and Katrine Ottosen." They released their debut album, "High Water I" in 2018.